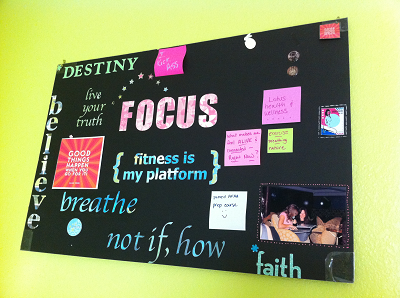 Vision Boards / Inspiration for Living an INTENTIONAL Life. 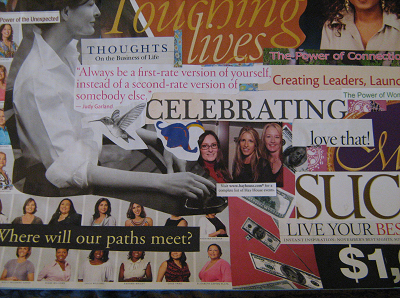 A Vision Board is an artistic physical representation of a person's wants or needs. 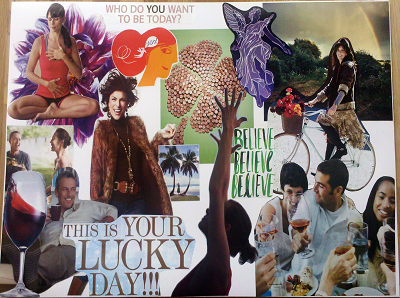 Vision Boards typically take the form of a collection of words and images pasted onto some kind of collage poster. The boards are meant to serve as a constant reminder of your hopes and dreams and to help you stay focused on the necessary steps to achieve them. 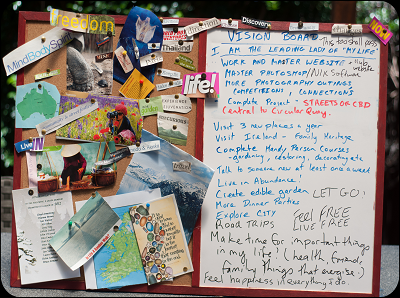 I like to think of Vision Boards as Visual Action Boards, as they should be used as just the starting point that propels you to take the crucially important ACTIONS which guide your way on the path of personal success. There are many ways to create a Vision Board -- as a poster, as part of a journal, in the form of an online screensaver -- but the specific method or design is not nearly as important as the content. It's extremely important to make sure that the Vision Board is a true reflection of your own wants and needs for personal fulfillment, not someone else's. The only person's destiny you have some control over is your own.